Great musician? : Photo by Martina Rathgens, flickr. 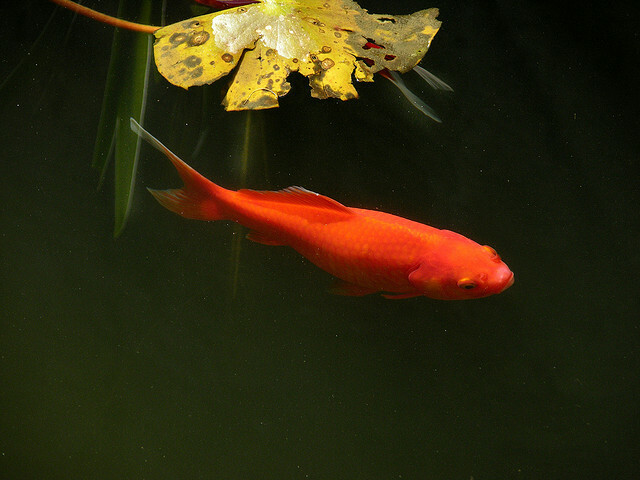 The mechanism is fairly simple to explain: the goldfish are housed in an aquarium, glasses of various sizes are placed on the aquarium's lid, motion sensors detect when a fish swims beneath a particular glass, and the sensors trigger a sound similar to the one produced when a wet finger is dragged across the rim of the glass. Still, you have to see it (and hear it) to believe it. Visit Chu's web site to play a video of the fish harp in action. In an interview with The Creator's Project, the artist explained a little about the concept: "... I didn't want to make this into an instrument, so I made it non-interactive and purely for enjoyment. It's just like keeping a fish. You don't get much interaction (although you can smack at the fish bowl, but the intention is to 'admire' the fish. Observation leads to experience and understanding.) I was looking for the most natural sound-generating method. Finally I thought of a 'glass harp' instrument. Fish bowl plus the glass harp concept became the artwork." The installation is on display at agnes b. 's LIBRAIRIE GALERIE in Hong Kong through January 12th.